Grangetto's Farm and Garden Supply Services - » Which Onions Should I Grow? Which Onions Should I Grow? Anyone can grow onions, right? How hard can it be? Just stick them in the ground in the fall and pull them up in the summer! Onions are fairly easy to grow, but armed with a few facts you’ll be sure to avoid some common pitfalls experienced by new gardeners. 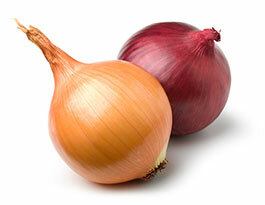 Onion varieties are categorized into three types: long-day, short-day and intermediate-day. These categories deal with the length of daylight needed for a particular variety to form a bulb. If you choose a variety that is not appropriate for your area, you run the risk of the plant bolting (going to seed), forming a small, premature bulb or not forming a bulb at all. Long-day varieties need 14-16 hours of daylight in order to form bulbs; because of this requirement, they are best suited to northern areas like Alaska or the Pacific Northwest. Some examples of long-day varieties are ‘Sweet Spanish’, ‘Yellow Early Globe’, ‘Ruby’, ‘Ebenezer’ and ‘Southport White Globe’. Short-day varieties require 10-14 hours of sunlight and are best grown in southern locales such as Southern California, the Southwest and Hawaii. ‘Bermuda’, ‘Super Sweet’, ‘Grano’, ‘Granex’ and ‘California Red’ are all short-day types. Intermediate-day types grow best in the interior valleys of central California, where they will receive the required 12-14 hours of sunlight per day. Some examples are ‘Red Torpedo’, ‘Ringmaker’ and ‘Autumn Spice’. How well onions will keep during long periods of storage also loosely follows these three categories. In general, long-day varieties store well, short-day varieties store poorly and intermediate-day types store moderately well. Onions prefer a soil that is loose, rich and well-drained. Be sure to incorporate a good-quality planting mix, rich in organic material, into the soil before planting; use more if the soil is heavy. Plant seeds, sets or transplants in the fall through early winter in a sunny location. Sets and transplants should be planted 4”-5” apart (or closer, if you want to harvest some to use as green onions). If using sets, plant them so the top of the bulb is barely visible. If you are starting your onions from transplants, trim the young plants about halfway back at the time of planting. Seeds should be sown ¼” deep in rows 15”-18” apart, then later thinned to 4”-5” apart. Because onions have shallow roots, they require moisture fairly near the surface. Remove weeds carefully so as not to disturb the plants root system. Be sure to fertilize regularly, especially early in the season. Remember – the health and vigor of the plant will determine the ultimate size of the bulb it forms. Choose the proper type of onion for your area, follow these simple planting and care tips and enjoy the harvest next summer!